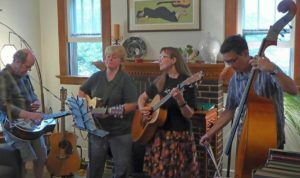 Hazel Run performs Nov. 17 at Gari Melchers Belmont to benefit Friends of the Rappahannock. Belmont is known for its great acoustic qualities. Many area residents have a close relationship with “their river,” which weaves through nearly every aspect of living in this region. Whether by history, adventure, or the arts, the Rappahannock helps define what it means to live here. 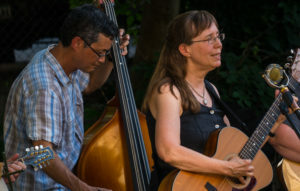 Band members Stuart Whitford, Linda LaFave, Stephen Hu, and Karen Richardson have been playing together for about two years. Influenced by singer-songwriters from across the spectrum, Hazel Run is reminiscent of Crosby, Stills, Nash & Young, and influenced by contemporary artists like The Wailin’ Jennys, and Patty Griffin. Richardson, an avid paddler, is often found on the water in one of her kayaks, especially when there’s a full moon. Her “River Song” begins with, “Where I like to go is on that river so slow, and travel with the night. Where I want to be is on that river, where my troubles one-by-one fall away from me.” It’s a heartfelt song, with Whitford’s nuanced mandolin work accenting the melody. Hazel Run’s Stephen Hu and Linda LaFave. Hu recalled tubing the river with FredCamp, a local non-profit, as a favorite river memory. Whitford wrote an instrumental, “Riverboat Pete,” about a riverboat that turned around just below his house, on its journeys to-and-from Fredericksburg. 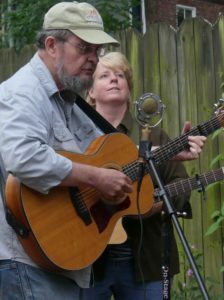 Hazel Run’s Stuart Whitford and Karen Richardson. Tickets and sponsorship information for An Evening with Hazel Run are on sale now. VIP tickets are available and include early admission to the Gari Melchers Studio.